Because I recently registered my puppies, AKC is sending me a monthly newsletter with chatty, informative articles about this and that. Generally I skim those lightly and move on, but this latest one was kind of convenient. Chocolate. Everyone knows this. No need to panic over tiny amounts, but you definitely don’t want the dogs getting into a giant bag of bittersweet chocolate chips. Onions and all the other aliums. I knew that one, but not everyone does, so just a note: don’t feed your dog his own portion of onion rings or you may be dismayed to find you have induced instant kidney failure. Uncooked eggs. The idea of feeding raw eggs to my dogs totally grosses me out, but it turns out that raw egg whites can also give dogs biotin deficiency. I only knew that because my vet warned me not to give raw egg whites to a picky eater. Not that I would have. Ewww. Cooked eggs are fine, obviously. Cinnamon. It says here cinnamon “can lower a dog’s blood sugar too much and can lead to diarrhea, vomiting, increased, or decreased heart rate and even liver disease.” I don’t know how much cinnamon that would take, but mental note: do not drop and spill the huge bag of cinnamon sticks I have in the pantry. Pecans, walnuts. Toxic, apparently. They can’t be too super-toxic because my little Papillons used to break open whole pecans and eat the nutmeats. Quite a mess as I’d have to clean up the shell fragments. Well, I see googling around that one of the dangers comes from moldy pecans infected by Aspergillus. I can hardly imagine anybody deliberately eating, or letting their dogs eat, moldy pecans. Yuck. Also this though: “[Pecans can] easily develop mold on the shells which contain tremorgenic mycotoxins which lead to seizures, tremors and/or neurological damage to your dog.” Not good. Okay, well, it’ll probably be another 15 years before the pecan tree in the back yard starts bearing nuts, but it’s something to keep in mind, I suppose. Macadamias. Totally, dangerously toxic. Macadamias “can cause vomiting, increased body temperature, inability to walk, lethargy, and vomiting. Even worse, they can affect the nervous system.” Did you know that? I didn’t know that. Very serious mental note to avoid letting the dogs eat macadamias. Well, I am not a huge macadamia fan anyway. Looks like that’s the lot! However I will add that my dogs are SO annoying about wanting to eat acorns, which I KNOW are toxic. I can just point at Dora and give her a stern look and she will drop an acorn, because I am constantly telling her not to eat them. I tasted one myself so I know they are bitter. Yet those dogs will break them open and eat the meats. Dratted creatures. Dogs have no sense sometimes. Of course I am most careful with any girl who might be pregnant. 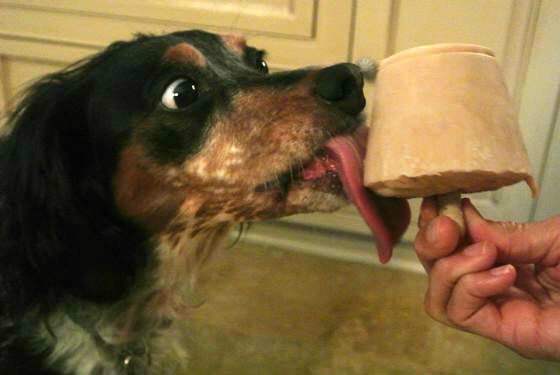 I haven’t ever actually made peanut butter popsicles for my dogs, but hey, I see there are plenty of recipes online. Because of course there are.